When contemplating a home renovation, whether it is an updated kitchen or a complete gutting of a home’s interior, many Ontario consumers may not even consider green upgrades in their plans. EnerQuality, which has been designing and delivering green building programs to the residential construction industry since 1998, would like to change that. In response to requests from RenoMark renovators and local home builder associations seeking reputable education for greening their renovation projects, EnerQuality has launched a program designed to train renovators to help their clients make smart choices, while distinguishing their companies in the renovator marketplace. The Green Renovator Project—a partnership between EnerQuality, the Ontario Power Authority, Reliance Home Comfort, Enbridge, Owens Corning, George Brown College, CMHC, BILD and OHBA—is offering training for renovators to help them incorporate best practices in energy efficiency and green building into their projects. EnerQuality is the creator and lead organization for this project, spearheading the development of the curriculum and program. 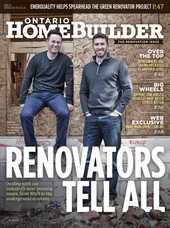 The program offers many benefits to both renovators and consumers. Besides the obvious advantage of reducing environmental impact, the greening of renovation projects will help to create healthier, more comfortable living spaces with improved air quality and protection from mould, chemicals and pollutants. But it’s also a savvy move from an economic standpoint, since these improvements can help lower operating costs and increase the value of renovated homes. With the successful development and pilot training program under its belt, EnerQuality conducted in-depth research to characterize Ontario’s renovator market and develop a go-to-market strategy to define training products and engage the industry. Consequently, the Green Renovator Project training is now available to renovators. A list of interested participants is being compiled, and classroom workshops are being arranged across the province. Training consists of five three-hour, hands-on workshops, including in-class discussions, exercises and a test at the end of each module. The curriculum emphasizes “the house as a system,” meaning that the house is a complex, interconnected structure rather than a series of rooms or components. Instructors reinforce this concept, with the goal of providing a holistic and comprehensive understanding for renovators looking to include “green,” even in the smallest projects. This workshop provides aspects of energy efficiency and sustainability in building science that are most relevant to renovators, such as the building envelope, applying energy-efficient windows, indoor air quality and ventilation, and maximizing the benefits of building orientation (e.g. passive solar). Through this seminar, renovators learn about the methods and tools of the integrated design process, an approach to renovations (large and small) as an interconnected system rather than individual parts. Topics include: project assessment, ratings “labels” (Energy Star, LEED, R-2000, EnerGuide, etc.) and their application to renovations, blower door testing, radon testing and renovation testing (pre- and post). These seminars look at the components of a house system—the building envelope, mechanical systems, materials selection, water systems and conservation, waste management, etc.—in relation to one another in the green renovation process. Topics include: house system trade-offs, the building envelope and renovations, indoor air quality maintenance, materials and waste management, water conservation and other conservation and renewable technologies (such as drain-water heat recovery, solar PV and solar hot water, HRVs and energy-efficient electrical/electronic products). Drawing on the learning and material from the previous sessions, this workshop gives renovators an introduction to the skills and knowledge they will need to effectively communicate and sell the added value of incorporating green into a renovation. Topics included: the value proposition of green renovations and financing (available green products, financing options and government incentives). Upon successful completion of the program, participants will be officially accredited as a “Certified Green Renovator,” recognizing that they have received training to help homeowners incorporate energy efficiency and sustainability-related elements into renovations, and that they have demonstrated knowledge in the core subject areas. The Green Renovator Project will not, however, certify homes as being “green renovated” and will make no guarantees with respect to the home’s improved performance or durability.